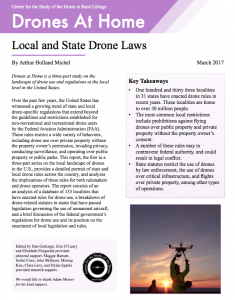 Today the Center for the Study of the Drone published “Local and State Drone Laws,” the first study in a three-part series on drone use and regulations at the local level in the U.S. The second and third studies in the series will explore the use of drones by first responders around the country and the various means by which drone rules are enforced at the local level. One hundred and thirty five localities in 31 states have enacted drone rules in recent years. These localities are home to over 30 million people. The most common local restrictions include prohibitions against flying drones over public property and private property without the property owner’s consent. A number of these rules may to contravene federal authority, and could result in legal conflict. State statutes restrict the use of drones by law enforcement, the use of drones over critical infrastructure, and flights over private property, among other types of operations. Interesting to see which direction laws and regulations are headed with respect to drones. The two most telling points are undoubtedly: (1) The most common local restrictions include prohibitions against flying drones over public property and private property without the property owner’s consent; (2) State statutes restrict the use of drones by law enforcement, the use of drones over critical infrastructure, and flights over private property, among other types of operations.